Raised By Wolves: (Left - Right) Yoko (Molly Risker), Germaine (Helen Monks), Wyatt (Caden-Ellis Wall), Della (Rebekah Staton), Cher (Baby Twin), Mariah (Erin Freeman), Grampy (Philip Jackson) and Aretha (Alexa Davies). Move over Shameless - a new sitcom aims to depict what working class life is really like. Writers Caitlin and Caz Moran get chatting to Jeananne Craig, and reveal the city that inspired their new show. Just moments into Caitlin Moran’s guided tour of her home town, and the award-winning columnist and author is dangling a lacy black bra in the air. Don’t panic - it’s not hers. The item belongs to one of the stars of her new sitcom, who’s removed it for comfort as we head off on a bus trip around Wolverhampton, along with show co-creator, Moran’s sister Caroline (Caz). Raised By Wolves is a six-part Channel 4 series, following a successful pilot episode that aired in 2013. It’s a modern-day re-imagining of the pair’s wonderfully chaotic teenage years in a large and unconventional working class ‘Wolvo’ family. The action focuses on “verbally incontinent” home-schooled Germaine, her introverted sister Aretha (based respectively on Caitlin and Caz, played by Helen Monks and Alexa Davies) and their siblings, as they deal with hormones, boredom and underage drinking in a roost ruled by single mother Della (Rebekah Staton). Uncomfortable undies off and microphone switched on, we’re ready to begin our tour of the haunts that inspired the show. With Caitlin at the helm and Caz on hand to offer her insights, we pass Beatties department store (“our Harrods”), Charlie’s Fish Bar (where one customer had a box of Ferrero Rocher battered), and Wolverhampton’s Central Library. The bus passes the now-closed Dorchester Nightclub, the “citadel of dreams” where the How To Be A Woman author first ‘got off’ with someone. “Once you were 12 and could stuff your bra they would allow you in,” she says, pointing out the “Steps of Truth” where bouncers would ask revellers what year they were born in. After passing some other notable attractions - the local skate park, a Hells Angels’ club, and the school Monty Python’s Eric Idle attended - we approach the three-bedroom council house Caitlin and Caz shared with their parents (who stayed together, unlike the family depicted in the series) and six siblings. The family relied on benefits and, like their Raised By Wolves characters, were home-schooled - which mainly consisted of “watching classic MGM musicals whilst eating lumps of cheese on a stick,” Caitlin says. As the coach pulls up outside the house and neighbours look on in bemusement, Moran explains her parents shared one particular belief - “that people might try and come and get us”. Funny anecdotes aside, it’s clear the Morans have a deep-seated affection for the city and its “dry, wry sense of humour”. “It may not have looked glamorous, but it was a place where you could live and grow and pursue your interests,” says London-based Caitlin, who became a columnist for The Times at the age of 18. 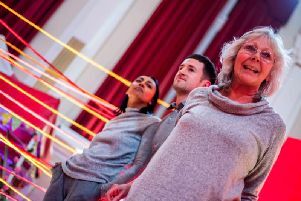 Raised By Wolves gave the sisters the chance not only to celebrate Wolverhampton, but to challenge the representation of the working class on shows such as Shameless. “You never see the working classes turning inwards and having a rich inner life [on TV],” says Moran. The pair also want the show to be an antidote to TV crime shows where a woman’s only purpose is to be bludgeoned to death.